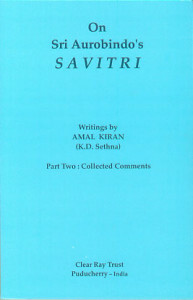 Whereas volume one of this two-volume set of Amal Kiran’s writings on Savitri consisted of completed essays, this second volume contains passages that have been extracted from various books, articles or letters. The idea was to gather these valuable comments which were scattered here and there and make them readily available. Typically the passages are a page or two in length, a few run to six or seven pages, and the longest – a talk – runs to about twenty pages. Occasionally there are a few passages that pertain to the same issue or line of poetry, and thus there is some overlap between them, but even in these cases there are generally unique points afforded. The writings are organized thematically in six sections: (1) Amal Kiran’s relation with the poem; (2) how to read Savitri; (3) particular passages, lines, words; (4) general comments on Savitri; (5) talks and letters on poetry; and (6) miscellaneous. There is also a useful index of lines in Savitri on which the author has commented, as well as a general index. I have found many jewels in this collection, which not only gave me deeper insights into Savitri, but also gave me enriching perspectives on sadhana and spiritual living. Because Amal was a master writer and poet and one of the most knowledgeable of persons about Savitri, who had for a long time corresponded with Sri Aurobindo about it, this collection provides the reader with rich insights into the poem and the nature of its poetry. It may be useful to give a few examples of its discourse in each of the six sections mentioned above. The first section discusses some of Amal’s personal experiences relating to the poem and his work on it. We find some helpful hints about how one can use Savitri as a means of spiritual growth, and an interesting experience he had in which reciting Savitri helped him recover from a persistent fever. There is also an engaging discussion of Amal’s interactions with the Mother regarding his work of proofreading and editorial corrections relating to Savitri. This essay gives us insights into not only Amal’s editorial work with the poem, but also with the Mother’s attitudes toward his work and her way of working with him. Perhaps most essentially, we get a feel for Amal’s inner relation with Sri Aurobindo and the Mother, which in various ways was articulated by remarkable lines in the poem. Read it so that your ear and not only your eye takes the poetry in. This means you must read it audibly. Further, try to receive the impact of the poetry as though the sound came from above your head and at the same time emerged from what the Rigveda terms the heart-ocean. This twofold arrival is the way of the Mantra. In the third section, there are many helpful analyses of particular passages and lines which can give us a deeper appreciation not only of the significance of these particular lines, but of the nuances of poetic composition in general. Here we find out many of Amal’s favorite lines in the poem, along with some inkling of what special significance he attributed to them. But what I enjoyed most was his analysis of the rhythm and sounds of particular lines, and while this is sometimes a bit technical, it can give a fuller appreciation of the poem. For example, for the line, “In the wide workshop of the wonderful world,” he explains that by using four ws “the expansive effect is tremendous and it is made most acute and conscious for us by the use of the very word ‘wide.’” This expression of significances (e.g., expansion) through sounds (e.g., w sound) is of course crucial in poetry, and in this section we get various examples in Savitri that give us clues to better appreciate these correspondences in other lines. We also find in this section an explanation of some perplexing or easily misunderstood lines. In a supplement at the end of the section, there is a useful reference to the passages in Savitri that bear on modern physics. One thing that there was surprisingly little of in this section, however, was explanations of the particular planes of consciousness with which certain lines were associated. In the fourth section (general comments), we find some commentary about the nature of mantra as it is exemplified in Savitri, as well as the standing of the poem in relation to other great epics such as the Ramayana and Mahabharata. There is also some interesting discussion about the Indian writing of English poetry, and how it can powerfully convey to the world the mystical experience and knowledge that India possesses. I also found a variety of interesting observations about the poem that enriched my appreciation. Perhaps most notable in the fifth section (talks and letters) is a long twenty-page letter written to a critic of Savitri in which Amal responds to a series of criticisms. This letter is very instructive to help all of us better appreciate various qualities and characteristics of the poem. He deals with such issues as its massive length, its use of epithets, its abstractness and difficulty of comprehension, its distinction from the style of Milton, which is born of the pure poetic intelligence. In another letter, he traces some parallels with the styles of Homer, Virgil and Dante. In another, he shows influences or accents of Shelley and Keats. In yet another, he shows us some notes of Wordsworth coming through the poem. These comparisons of lines in Savitri with those of other great poets help us to better appreciate its finer rhythms and higher amplitudes. In the last section (miscellaneous), I found some of the most valuable comments of the entire book, in part because they pertained more generally to the spiritual life than to specific aspects of Savitri, which often were brought in only through a line or passage that exemplified the point he was making. For example, in two different passages the author makes some comments about sadhana which were summed up by the line, “All can be done if the god-touch is there.” Perhaps my favorite passage in the book is in answer to the question, “What is it to be an Aurobindonian?” In brief summary, Amal notes that it is one who “carries on the practice of the presence of Sri Aurobindo and aspires to catch as much as possible the traits which we discern as typical of him.” Then, to catch the essence of those traits, he quotes the lines from Savitri: “A poised serenity of tranquil strength, | A wide unshaken look on time’s unrest”. His further elaboration of these traits is most touching and inspiring. 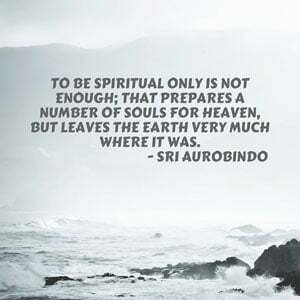 We also find in this section an excellent discussion culled from a longer article on the spiritual significance of Sri Aurobindo’s passing. These various examples mentioned here can only give a taste of the contents of the book and perforce overlook many of its wonderful nuggets of golden wisdom. It may be noted that as its subject matter is Savitri, an incomparable revelatory poem, and that throughout the book are quoted various lines and passages together with insightful commentaries on them, it cannot fail to transmit a radiant splendor. This is perhaps a book primarily for Savitri lovers, those who want to penetrate deeply into its inexhaustible store of wisdom and delight, but surely all who read it will be elevated by its treasures. Larry works at the Sri Aurobindo Centre for Advanced Research (SACAR) in Pondicherry facilitating online courses on Sri Aurobindo’s teachings, and also edits and writes for publications related to the work of Sri Aurobindo and the Mother.